Our Company’s Integrity and Experience Starts at the Top. Bill O’Connell, our president, has been involved in the Public Adjusting business for over 30 years. He has negotiated and settled thousands of residential and commercial insurance claims on behalf of his clients. He has an extensive background in the mold, fire and water restoration industry and uses his expertise to handle all of our client’s insurance claims with an insider’s perspective. With this knowledge and experience on your side, he and his staff will be sure you receive the highest settlement possible from your insurance claim and we’ll be by your side every step of the way. Want to speak to one of our satisfied customers who have received insurance payments above and beyond what their homeowners insurance first offered? Contact us today and we’d be happy to provide as many referrals as you’d like. Fire damage, flooding, mold, vandalism, burst pipes and wind & storm damage are never planned. When disaster strikes, it’s important to weigh out all of your options as a homeowner. Our team of public adjusters has seen just about everything over our many years. We’ve helped clients cope with and recover from every major natural disaster over the past several decades and have settled thousands of insurance claims for fire, water, mold, smoke and wind damage and everything in-between. 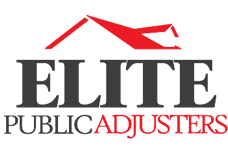 What Exactly Does Elite Public Adjusters Do For The Homeowner? Simply put, we get you the money that you deserve from your insurance company. As the policyholder, you are entitled to insurance payouts when damage occurs at your home. Your insurance company hires their own public adjusters to protect their own interests and unfortunately, this often means that policyholders do not get the fair insurance settlement that they should. By having your own public adjuster at your side, arguing on YOUR behalf, homeowners are able to even the playing field and get the fair settlements that they’re entitled to. Remember: No Recovery, No Fee Charged! You have absolutely nothing to lose and everything to gain. If you have any property damage to your home, call Elite Public Adjusters today! We know the world of insurance adjusting is a complicated one and we’re here to negotiate on your behalf. Let our experienced team of public adjusters guide you through the process and protect your greatest investment, your home.